We have had a very eventful time of it! 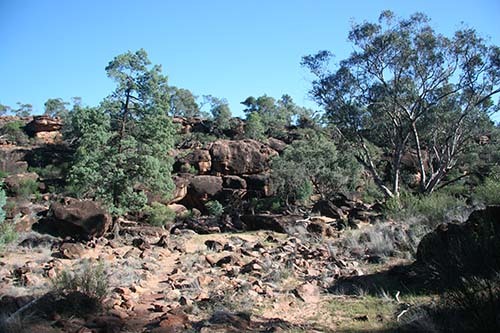 After a very relaxing time in Wilcannia, we headed to Tilpa along the Darling, on the eastside Road. We found the first 20 kms or so easy going, then we hit a stretch of black mud. Ahead of us we could just see something stationary, which turned out to be a caravan and car, stuck, meaning we had to stop. The car ahead was a small, all-wheel drive – definitely not a car for towing a van through mud. We thought we’d get out of the centre wheel ruts that we were in, get down onto the side of the road, then travel carefully passed him. That didn’t happen. As soon as Russ turned towards the left, the car slipped further to the left. Turning the steering wheel did nothing. Then, the caravan started sliding towards the car, hit the bumper and the reversing light, then slid back a bit to the right!! Russ put the car in reverse and unbelievably, it backed up, back into the ruts in the middle of the road. We couldn’t believe it. When Russ first walked up to the driver (who was having a cup of tea and not doing anything about his situation). Russ then walked back up to van and car with a spade, dug them out and they were able to get going, except they were travelling too slow and got stuck again. In the meantime, we were getting mud off our boots, putting a bag down at our feet, so that we didn’t get mud everywhere and started off. We were both very nervous and by the time we reached the other guy, he had got going again, still travelling too slow. The road had improved and we were able to pass him on the right, pleased to be rid of him. 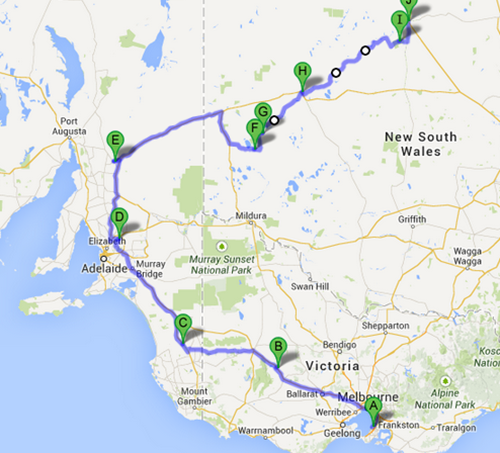 We travelled about another 20 kms until we reached the Paroo-Darling National Park. This was a site for sore eyes. A beautiful little spot, on the Darling, with Gas BBQs, toilets, tables, camping spots, etc. There was a 73 year old lady there, waiting for the road to dry out, so she could drive her motor home to Wilcannia. I hope she made it through OK. Feeling refreshed after lunch, we headed off with no more incidents. The road wasn’t too bad. We arrived at Gundabooka National, found a great spot. The temperature during the day was probably 16 degrees, with a freezing wind, so we gathered some wood, lit a fire and watched the park fill up. We enjoyed the park very much, but it was 0-2 degrees overnight, no power and too cold. Yes, we are getting soft. 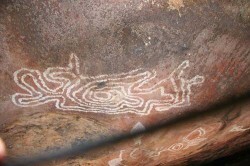 Before leaving the next day, we drove to see the rock art, which was good. The walk was through some wonderful, rocky country. Returned, hitched up and drove through the park to the Darling at Yanda Campground. Only a couple of good campsites, most have no trees, but we found a table under a shelter for lunch, with surrounding trees, an enjoyed a relaxed lunch. After lunch we set off for Bourke and arrived at 2pm. 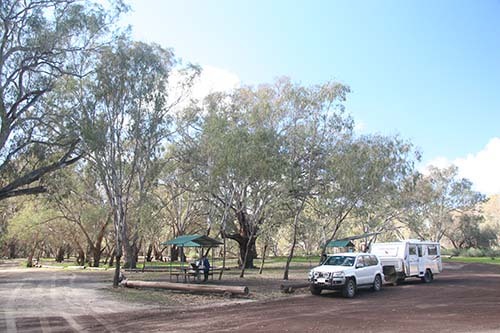 We have stayed at the Kidman Camp before – it is at North Bourke, on the road to Cunnamulla. 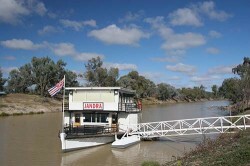 There is a paddle steamer here, doing two 1 hour trips a day, a bush poet. The shopping centre in Bourke is quite extensive, compared to other towns we’ve been through and there are less bars on the windows. People are working very hard to improve the reputations of their towns. Everyone is very friendly. We are here for three days, before we go to Aldville Station, 100 kms north of Cunnamulla. We are booked in for three days and we don’t know if we will have 3G or not. Oh, aren’t you having fun in the mud!!!! We drove up to Cobar on the 3rd.June 1969 on our honeymoon, and the road was just black mud the whole way. We daren’t stop at all as we knew we would never get started again, and we were only in a panelvan….but we made it, we were lucky.